Did Jesus Die in Vain? Daniel and his friends refuse to eat the King’s food. 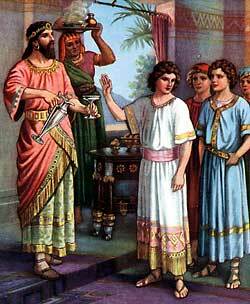 IN THE KING’Spalace at Babylon a company of young boys were being entertained. These young lads were strangers in Babylon. But there were not strangers in a king’s court, for they had lived in a royal palace in their home country. Among this company were four bright-eyed, handsome youths who seemed to be more thoughtful than their friends. These boys were Daniel, Hananiah, Mishael, and Azariah, and they had come from Jerusalem with the first captives whom Nebuchadnezzar had carried away from Judah. They have been princes in Judah during the rule of King Jehoiakim, and they served the God of Israel. King Nebuchadnezzar had commanded his chief officer of the palace to choose this company of young boys and to teach them the learning of the Chaldeans. He wished to have them well trained, that when they should become grown men they might be able to help rule the great kingdom of Babylon. And he had appointed his servants to carry choice food from his own table to set before them every day, that they might eat of it and grow into sturdy manhood. Now, Daniel and his three friends wished to keep the law that God gave to the people of Israel; and that law forbade them to eat of certain kinds of food. But the heathen nations, like the Chaldeans, had no regard for that law, and they prepared food that the Jews called unclean. They also cooked their food in certain ways that the law of Moses condemned. Daniel and his three friends knew about these differences between the Chaldeans and their own people. And they decided to refuse the King’s food, lest it should be the kind of food that Moses in his book had forbidden the Israelites to eat. God knew about the desire of Daniel and his friends. And God caused the chief officer of the King’s palace to love these young boys. When the food was brought before them from the King’s table, Daniel stood up and bravely told the officer about his desire not to eat of that food, lest he should be breaking the law of his God. He also pleaded for his three friends, Hananiah, Mishael, Azariah, that they, too, might be allowed to refuse the King’s food. At first the officer was afraid that the King might be displeased if the boys refused to eat food from his table. Because the officer loved these boys he agreed to do as Daniel had asked. And for ten days he fed them vegetable food and bread instead of the meats and wine from the King’s table. At the end of the ten days the officer saw that Daniel and his friends were even healthier-looking than their companions. So he continued to give them the food that they desired. And God blessed these boys with much wisdom, so that they quickly learned the language and the wisdom of the Chaldeans. When three years had passed the King requested that the young boys should be brought before him. He examined them with hard questions, and he saw that Daniel and his three friends were wiser by ten times than were any of the wisest men in all his kingdom. Nebuchadnezzar was well pleased with these young Jews. He gave them places of honor among his own people, and they continued to live in Babylon for many years.